Cape Town - South African fast bowler Dale Steyn captured his 300th Test wicket when he bowled Doug Bracewell on the first morning of the first Test against New Zealand at Newlands on Wednesday. Steyn, 29, was playing in his 61st Test. Only Australia's Dennis Lillee, who achieved the feat in his 56th Test, and Muttiah Muralitharan of Sri Lanka (58) have reached the milestone in fewer matches. 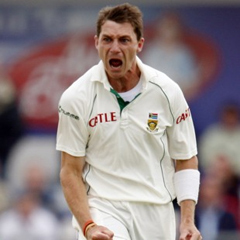 Steyn, currently the world's number one ranked Test bowler, joined West Indian Malcolm Marshall and New Zealand's Richard Hadlee in taking 300 wickets in 61 matches. "It's an unbelievable achievement," said South African captain Graeme Smith before the match. Steyn had to wait until the third ball of his second spell to take his first wicket of the match and was overshadowed by new ball partner Vernon Philander who took the first five wickets at a cost of four runs. Steyn's strike reduced the tourists to 31 for seven after they won the toss.